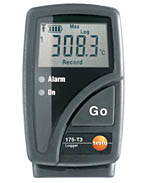 The 175-T3 temperature data logger logs temperature at 2 different points simultaneously over a period of several days, weeks or even months. The logger provides fast documentation of e.g. temperature fluctuations in industrial processes. Surface, immersion and air probes are available for a wide range of applications.